Shown below are a number of approaches to caring for pottery as suggested by members of the On-line Art Pottery Discussion Group. These are approaches that have worked for them. There is no guarantee that they will work for you. Before using any of these suggestions on a valuable piece of pottery, the AAPA recommends you consult a competent restorer or conservator. "One of the pots I bought...is a low bowl... with a satiny matte blue-green glaze. It must have had a flowerpot or some other watery thing inside, because when I bought it, it was crusted over inside with a mineral deposit of some kind...When I got home, I was able to brush off much of this deposit, then I washed the inside of the pot, and more flaked off. (The glaze underneath is quite intact where I've gotten the stuff off)... I scraped at the stuff with my fingernails, which are now quite worn, since this stuff has the texture of sandpaper. I scraped with a plastic knife, which I thought would not scrape the pot. It didn't, but the stuff didn't come out, either. I tried filling it with a mixture of 1/2 water, 1/2 vinegar, which didn't seem to work any better than the water alone, and then I decided I should ask people who know more about these things! I think this deposit is equivalent to what collects inside teakettles in hard water areas. Any help with this would be greatly appreciated! " "Use Lime Away with rust remover to clean the pot. Either submerge it in a plastic bucket or fill the pot and keep applying to the deposit on the outside until it is clean. Do not use Clorox. It will go into any crazing and will continue to leach a white powdery substance out of the crazing for months. It will also cause the glaze to eventually fail. If the rust remains, use CLR or a cleaner containing oxalic acid to remove the rust. Do not dilute either cleaner. Depending on the type of deposit, you may need to use both Lime Away and CLR. "Okay I don't use it on any Great items but toilet bowl cleaner has worked terrific for me. It works great on rust and lime and doesn't ever seem to hurt the glaze. I know it seems a little toxic but is incredibly fast. Any good or bad stories on this? Rod"
"Don't use Dip-it. I tried this and it took the color where the glaze was crazed. I tried an old pot of no value just to see, not good results. I sure hope no one else tries it; it does severe damage to a pot! Denture tablets work, I have used them." "I've not used Dip It, but have had great luck with the classic household stained-teeth-and-coffee-pot cleaner, baking soda. I usually wash the pot, then just mix three to four tbs with about a quart and a half of water and let the pot soak for 15 to 30 minutes, then wash well again in mild dish soap and water. I've used this only on glass and hard enamel finishes. I do not know if it would be recommended for others. I've found baking soda to be a great and mild all-purpose cleaner for scale, dirt and many stains." Thoroughly soak the pottery piece in water. Pop the pottery into a large plastic bag, seal the bag, and put it away. Check the pottery every 3 days or so. If the rags dry out and the crazing isn't lightened sufficiently, re-soak the rags in solution, reapply to pottery, put it back in the plastic and wait longer. This process may take several WEEKS (yes, I said weeks) but it does lighten heavy crazing. I tried it on an old McCoy vase that looked like tortoise-shell (it was supposed to be white.) After three weeks some of the crazing had completely disappeared, and the worst had lightened enough that I felt OK about putting it on Ebay. It really helped. So does having patience. I wouldn't use this technique on a cold-painted item." "I use hydrogen peroxide to bleach out crazing. Buy the 40% solution from beauty supply houses. Do not use the over the counter weak solution available at drug stores. You do not need to dilute the solution with water. DO wear water proof gloves to protect your hands. Yes, it may take weeks to bleach out the dirt. I hadn't mentioned this procedure because the question was relating to mineral deposits. An important first step that I take for granted and didn't mention was a thorough cleaning before placing the item in peroxide. Always thoroughly clean any pot before bleaching. First, wet the pot thoroughly and brush lightly to remove dirt. Next, I use a spray cleaner like Mean Green or Thunderbolt. Failure to wet the pot before applying the cleaner or bleaching could result in "setting" the stain or dirt making removal next to impossible. This is particular true of bisque finishes like Wedgwood, Radford Jasperware, Ecanada, and Bement. Some restorers use the cleaners for false teeth and claim great results. I tried one of them 20 years or so ago, wasn't pleased and never tried them again. Just last week at the Association of Restorers convention at San Jose, someone told me they were using false teeth cleaners and were very pleased. Most of us use hydrogen peroxide. Do not use Clorox. It will go into any crazing and will continue to leach a white powdery substance out of the crazing for months. It will also cause the glaze to eventually fail." "I recently acquired a great Weller Hudson vase, and it had little velvet dots on the bottom when I bought it. I 'm curious if anyone has an opinion on these. Everything else I own is "dot" free, and my first impulse was to try to rip 'em off. I stopped immediately, because I was afraid that I might damage the areas where the dots touch the glaze. For now, I'm leaving them, but does anyone have a recommendation as to how to remove these safely? Would you leave them on?" "I'd leave them on; however, if you suspect foul play, I'd use a touch of acetone to remove them. Just bast it on with a Q Tip and let it soak on the felt pads, then gently pry them off with your fingernail. If paint comes of THEN, then you're dealing with repair and that is when I'd call the dealer and proceed accordingly. (Acetone should not hurt the fired glaze on a piece of "Hudson"). Good luck!" "If you want to take off the dots, dampen a cloth or cotton ball with nail polish remove (acetone) and soak the dots. They should come off easily without damaging the glaze. 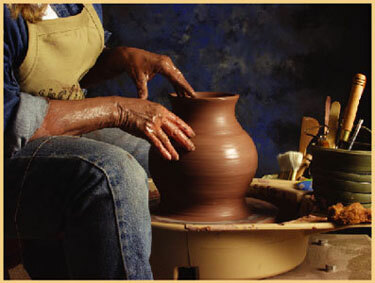 Acetone will clean glazed pottery without damage. It will remove cold paint or anything applied on top of the glaze." "Many felt pads have been dyed with various colors which may bleed if exposed to water and certainly if exposed to solvents. This soluble dye can travel into glaze craze or fine hairlines and set as a permanent stain if you are not careful. It would be best to peel them off of the foot rim first and then remove the adhesive residue with a swab of mineral spirit (excepting areas of previous restoration). If you are buying felt pads, opt for the white ones." "I have to put my voice in for the Goo Gone. That stuff works miracles. I'd soak the piece first to remove the felt then the Goo Gone will remove the remaining glue. It'd also work without removing the felt first but it's going to run the color from he felt I think. I use that stuff on anything I can't get off with a washcloth." "I have Fujiyama and Woodland pieces that have an accumulation of dust and dirt on the unglazed portion of the exterior. They are really special pieces and I would commit Hari-Kari if I damaged them in the process of cleaning. Any help on this one?" "I suggest a good new make-up brush. Not a small one. Then very carefully dust the area you indicate. Also a steady stream of air like the kind that comes in a can to clean computer keyboards might help. Above all, go slowly and carefully you lucky man." "I was wondering if you could help me on the subject of removing silver marks on a white matte piece." "My tip is for removing those dark metallic looking marks on Van Briggle and unglazed pottery. What works for me is a few gently strokes with a Scotch-Brite pad that has some WD-40 on it. I have to stress the GENTLY part!!!" "Try rubbing gently with a hard rubber eraser -- the kind that used to come on some ball point pens; white and a little "gritty" to the touch." "Silver marks can be removed with a product called bar keepers friend. I would test it on an inconspicuous spot but it is terrific stuff. It also is good for rust marks."